You can use an old pair of jeans in a number of ways. One of the best ways to make use of your old pair of jeans is by turning it into a denim tote bag. We all need bags to carry our stuff at grocery stores, malls and various other places. Here are some steps to help you make a nice denim bag.
. Cut the rectangles in the size you want your tote bag to be. You can also use an old denim skirt or top to cut bigger rectangles.
. Position the hems at the top and fold your rectangles in thirds lengthwise. Mark the two inside creases and make sure you fold across the length of the fabric. Place one rectangle on top of the other, with the reverse sides facing outward; then sew the sides, bottom and corners. Fold the bag so that the bottom and side seam are stacked on top of one another. Now sew across the corner and make sure to keep the new seam perpendicular to the existing ones. Repeat this process on the other corner. Flip the bag right side out, and you’ll see that the corners are blunted. Now line the bottom and side seam up so that you can sew across them. Now you can make the handles of your denim bag. Cut two 2-inch-wide strips of a strong black fabric. You can also cut two strips out of your jeans. Pin and stitch the handles to the bag. Take a long piece of decorative lace, cut it into two pieces and stitch them to both sides of your bag. You can add more charm to your bag by stitching a fabric flower at its right side. You can easily make a denim tote bag with the help of some useful tools. Spring scissors feature a spring that helps you cut a thick piece of cloth effortlessly. 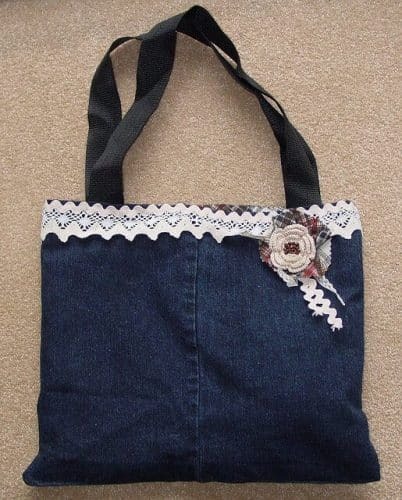 The jeans thread, decorative lace and fabric flower will be sure to make your denim bag sturdy and beautiful. So give these steps a try to make an amazing denim tote bag at home!